To help with reporting and menu sorting, we’ve added the following subtypes to the Extract product category on the PO: badder, sorbet, rosin badder, and dry resin. Your eCommerce menu just got even better! Now, customers can click your shop’s logo (in the upper left-hand corner) and be redirected to your main website (or another URL of your choosing). To configure the destination URL, head to Configurations > Config Page > eCommerce > General Requirements > Logo URL Link. You asked for an easy way to upload your shop’s logo as a placeholder image for products online, and now you have one. Head to Configurations > Config Page > eCommerce > General Requirements > Placeholder Image and upload an image of your choosing. Psst! This field is right below the new ‘Logo URL Link’ setting we mentioned above, so you can kill two birds with one stone. If you have our delivery integration configuration enabled (here’s looking at you Onfleet! ), you’ll notice a new ‘Open In’ button displayed on the order card within the Fulfillment dashboard. To help standardize your referral source data, we’ve added a drop-down to the ‘Customer Source’ field on the customer profile and to the ‘How did you hear about us?’ pop-up on the eCommerce menu. This improvement lets you configure all possible options by heading to Configurations > Config Page > Reasons > Category: ‘How did you hear?’, and having customers choose from a predetermined list. As you might have heard, the state tax rates were recently updated. So, we’ve updated our dynamic tax tables to match. This will ensure that no matter where you or your customers are located or what type of order you’re fulfilling, you’re always charing them the correct amount. Have no fear, if you change the size of a product on an already accepted PO, it’ll now be reflected accurately in Sell Treez, too. When using our Target Total feature, you’ll need to make sure that rewards points are being applied to the balance first, before entering any additional payment methods. This will ensure the system can accurately recognize the remaining balance and will prevent you from applying the incorrect amount of points. When printing patient labels, the Patient Medical ID # will be printed on the label properly, instead of showing as ‘N/A’ . We’ve fixed the issue that was causing the delivery fee to be left off the printed receipt. When a new eCommerce sign-up is cancelled during the ‘Verification Pending’ stage, items will again be returned to your live inventory, instead of getting lost in limbo. ﻿When you add spaces in a product description, you will no longer see weird characters like “<br/>” appear on your online menu. You’ll no longer encounter the issue that was preventing you from checking out a customer (in Sell Treez) if they were part of a lifetime discount group (eg. senior, veteran, employee, etc.) that was removed from the Discount Module. To improve the online shopping experience for you and your customers, we’ve added an additional auto-text notification to the eCommerce configurations. If enabled, a customizable SMS message will be sent to customers who place an eCommerce order during your business hours, letting them know their order has been received and will be available for pick-up anytime before you close. This message will only be applicable for shops that have “Business hours only” selected (shown below) for holding an order. Try it out: to update your eCommerce auto-message settings, head to Configurations > Config Page > eCommerce > Hold Order. 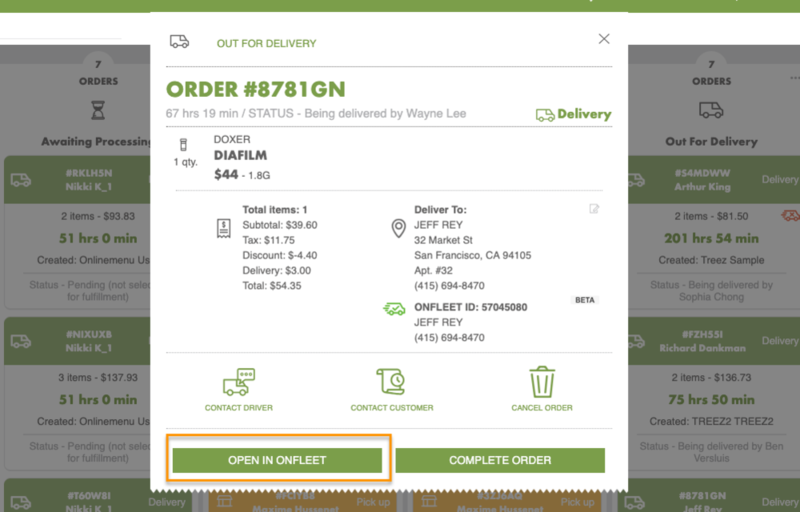 To help reduce the amount of manual entry needed when it comes to moving customer and order information over to a 3rd party delivery platform, we’ve made it so you can copy and paste information directly from the order card on the Fulfillment dashboard. The issue that was causing the pre-discounted subtotal from being accurately displayed on the Fulfillment dashboard has been resolved. Going forward, the same total will be shown in the dashboard as is shown in Sell Treez. We’ve squashed the bug with the order notes box in Sell Treez. Now, when you hit ‘enter’, the cursor will jump to the next line — exactly as expected. To improve the experience for your delivery drivers, we’ve updated our Google Maps API integration. This improvement will make it so anytime your customers are asked to enter an address — like when placing an order for delivery via eCommerce — they’ll be required to choose from a list of Google Maps-generated addresses. Ensuring that you and your drivers always have a legitimate address to deliver to. While rapidly tapping the buttons on the payments screen of Sell Treez may be fun, it’s not always the most effective... and can result in system errors. To help safeguard against payment submission issues, we’ve made it so only the first button tap will register in the system, and any subsequent taps will merely be for your cathartic enjoyment. So, tap on ladies and gents — tap on. When it comes to calculating purchase limits every state is a little bit different. To account for the specifications that exist in AZ and MI, we’ve made it so the limits in those states will be calculated off the amount entered in the ‘Total Amount of Flower’ field that we recently added to the PO. Note: If you’re not in a state that requires you to record the total amount of flower for each product, then you won’t see this field on the PO, and your purchase limit calculation will remain unchanged. We’ve resolved the issue that was preventing newly invoiced products from displaying on the online menu. Note: This issue only affected users on version 1.19.2. For our users with slower or unreliable internet, you might have received a few “Error processing payments” notifications recently on the checkout screen of Sell Treez. To help account for this, we’ve made some performance enhancements, which will help safeguard against these errors being thrown when processing payments with sluggish internet. The bug that was causing your Fulfillment Dashboard configurations to revert to their previous settings has been squashed! Going forward, we’ll make sure that whatever settings you enable will stick with you until you’re ready to update them. We thought we had finally managed to get every possible size you might need added to our product dropdowns, but alas, we did not. That’s why we’ve added two additional size options on the PO for prepack products, one for 28.5g and one for 3.7g. A ‘Total Mg Per Unit’ field has been added to the product details card for the Misc. Cannabis product category. While not the most commonly used category, this is where products like suppositories, sublinguals, and cannabis toothpaste should live. With the inclusion of this field, you’ll now be able to have misc. cannabis products attribute to customer’s purchase limits. (AZ Only) Speaking of newly added fields, our Arizona customers will see a new field on the PO for ‘Total Amount of Flower’. This is where you’ll enter… wait for it… the total amount of flower used to make the final product — bet you didn’t see that coming, did ya? We know this is a hotly requested addition, so we hope you enjoy it! In preparation for the increased volume you’ll experience on 4/20, we’ve made some adjustments to the search functionality in Sell Treez to improve stability and performance. Instead of products populating dynamically every time a new letter is entered, you’ll simply need to type in your search term (it can be a single letter if you’d like) before pressing enter or hitting search. Since the new search button now resides where the ‘Categories’ button used to be, we’ve moved the Categories button down to the bottom of the screen — directly next to the Expand Results function. For those who utilize our rewards as a discount feature, you’ll notice another great Sell Treez enhancement that improves the system’s real-time responsiveness. As soon as you’ve applied a customer’s rewards points to an order, we’ll immediately deduct that amount from the balance displayed — allowing you to verify that the correct amount has been removed. A few months back, we introduced the ability to add, remove, or update the customer attached to an order at any time during the ordering process, without affecting the items in the cart. (Psst! If this feature sounds like something you’d like enabled, reach out to our support team and mention that you’d like to enable our “POS customer modification” feature and they’ll flip it on for you.) And today, we’re making this feature even better! For those of you who already have customer modification enabled, the biggest changes you’ll notice is that we’ve changed the functionality that occurs when ‘See contact info’ is selected. Instead of opening the full profile within Customer Intake, you’ll be able to edit the customer’s phone number and email directly from Sell Treez. Should you want to view/edit the customer’s profile more in-depth, you can do so by tapping the new View Profile option. For those of your who have customer modification disabled, the only change you’ll notice is that you now have an additional option to ‘View Profile’ when ‘See contact info’ is clicked. Tapping View Profile will open the customer’s profile and allow you to edit things like forgotten lifetime discounts, rewards points, and any other customer information found on their profile. Performing inventory counts takes long enough as is. To help make your job easier, we’ve made it so that you can sort your products on the Inventory Count page alphabetically by SKU. If there are multiple SKUs assigned to a single item, we’ll sort them based on the first SKU that appears in the list, whereas the additional SKUs associated with that item will be ordered randomly below it. The ability to export the Inventory Count sheet has been restored. Previously, discounting 1 or more cannabis items with a 100% discount would result in the POS Ticket report displaying an incorrect ticket total for that purchase. Luckily, we were able to identify what was causing the display issue and now, the POS Ticket report will display the exact same amount as the receipt, every time. We’ve resolved the issue that was allowing users to ‘Apply All Rewards’ multiple times to a single order when rewards as a discount is enabled. This fix safeguards against accidental double clicks when discounting items and applying rewards. When going live with a batch from the POS, only the number of remaining units will be made live, as opposed to the number of units outlined on the original PO. We’ve squashed the bug that was causing notes lefts on the customer profile to save somewhat sporadically. Going forward, comments left in that field will stay there until you choose to edit or delete them. Our menu auto-scroll feature lets customers experience each product you have available for purchase, alongside a snazzy product photo. Just flip it on and watch it scroll through your entire menu. When it gets to the bottom, it’ll reload and start again from the top. While this feature itself isn’t new, we’ve made it so images will be cached instead of needing to be reloaded each time the menu jumps back up to the top — improving performance and stability. Don’t have our menu auto-scroll enabled? Head to Configurations > Online Menu > click the Autoscroll checkbox. In preparation for the flood of customers you’ll receive on 4/20, we’ve made some performance enhancements to the customer queue. Regardless of whether you have 4 or 400 people waiting to be served, the speed and responsiveness of both Customer Intake and Sell Treez will be unaffected. Letting you get customers in and out as fast you can pack the orders! To help you better track the growth of your business, two new signup dates will be stored for each customer that signs up — one for the in-store signup date and one for the eCommerce signup date. While these dates won’t be visible in the customer’s profile, they can easily be reported on through Metabase. With so many amazing products on the market, it’s no surprise your customers want a wide selection to choose from. That’s why we’ve increased the number of products that can be displayed on your online menu from 1,000 to infinity… and beyond! For our customers who collect arm’s length excise tax, you’ll no longer experience the issue that was causing excise tax on refunded items to be calculated off the cost of your current shipment as opposed to the shipment the unit is actually associated with. If a customer returns a purchase they made using rewards dollars, the redeemed rewards will be returned to their balance, and we’ll also make sure that the points they earned on the initial purchase are also removed. Occasionally, when a receipt was printed through HWA odd characters would appear anywhere a space was. Luckily, we were able to decipher the code and have restored your receipts to a non-hieroglyphic state. The ability to print batch labels from Inventory Control has been restored. To improve speed and performance on the Fulfillment dashboard, we’ve added a configuration to auto-clear the Completed orders after a customizable amount of time. This means, if you want this column to be cleaned out every 5 minutes or 5 hours, we’ve got you covered. Ready to set your refresh time frame? Navigate to Configurations > Config Page > eCommerce > General Requirements > Enable the ‘Remove Completed Sales After’ toggle and enter the desired number of minutes > Enjoy! If a item has multiple SKUs assigned, we previously weren’t separating them with a comma on the Inventory Count CSV export — making it nearly impossible to know where one SKU ended and the next began. So, in addition to placing a comma between each SKU, we’ve also introduced a brand new column for the Product ID. To safeguard against edits being made to the Metrc package label in Treez after a PO has been accepted (which results in inventory discrepancies in Metrc) we’ve made so that the state tracking ID (aka the Metrc tag or package label) will be locked after a PO has been accepted. Meaning, you’ll still be able to leave it blank or edit it while it’s in draft mode, but you won’t be able to update it after you’ve hit Accept. We’ve resolved the issue that caused the Metrc polling service to stall out. Now, data will flow uninterrupted between the two systems. To help facilitate even more seamless deliveries, we’ve added a new apt/unit field to the customer address. New customers will be prompted to enter a unit number when placing their first delivery order, while existing customers can update their address by navigating to the hamburger menu (on the online menu) > Account > Address or speaking to someone at Intake, since this field is now available on the customer profile as well. We’ve added another trigger point for auto-printing receipts from the Fulfillment dashboard. By navigating to to Configurations > Config Page > eCommerce > Display Preferences > (scroll down) Enable Automatic Printing > enable desired receipt printing trigger points. In case you’re wondering, it’s the ‘Completed’ status that’s new this this list. In hopes of capturing all your requests for unique product sizing, we’ve added every rational product size we could think of to the size dropdown for different product categories on the PO. Need to run Intake and Sell Treez on the same browser? No problem! We’ve gone ahead and locked Hardware Agent to each specific Treez page, rather than to the browser itself. Meaning, Sell Treez can use one hardware agent location while other pages use different locations — all within the same browser and without issue. In other words, say goodby to your printer location getting reset when toggling between pages. The issue that was causing PO’s from out of state operators to be printed with a subtotal and total cost of $0 has been resolved. Our dynamic product search in Sell Treez is beautifully simple and oh-so effective for making recommendations to customers. And now you can feel confident that you’re seeing every single product in each category… every time you search. No more wondering if you’re seeing everything in your inventory or just a portion of it. NOTE: When attempting to print receipts from the Fulfillment dashboard when using ‘Print Window’, you’ll need to ensure that pop-ups have been enabled on this page or you’ll run into some issues with the print window pop-up being blocked. Preparing an order through the Fulfillment dashboard has never been easier… especially at a glance! Now, each product in an order will be coupled with the appropriate icon for that product type along with it’s accurate weight. There was a bug that was preventing shops who support ‘No Customer’ orders from being properly processed through the Fulfillment dashboard that has been resolved. Meaning, regardless of your internal order rules, you’ll be able to use the dashboards awesome functionally. To make it easier for customers to find certain products on your online menu, we’ve beefed up our search functionality to allow them to search by product type, classification (hybrid, I/S, S/I, sativa, CBD), and attributes (general, flavor, effect, ingredients) as well. As soon as a customer starts typing, we’ll display any products or attributes that match the letters already entered — some call this predictive text, but we like to think of it as unparalleled customer satisfaction. We unintentionally heightened the security measures on the menu board and pole display pages, which meant users were being asked to log in before being able to view menu info. But we’ve gone ahead and reverted this ever-so-secure misstep so customers will be able to view these pages without having to log in first. We did a little maintenance on our API’s to ensure our integration partners, like Baker and SpringBig are not only able to capture our new apartment number field, but also don’t encounter any issues pulling customer information when they have notes in their profile. (NV Only) In an effort to make identifying and resolving issues easier when uploading sales to METRC, we’ve made it so that all sales uploads, regardless of their status (success or fail), will be included on the export of the METRC Sales Upload report. ﻿When sending sales data to Metrc, we’ll ensure the exact local time is attached to every sale, regardless of what timezone your shop is located in. We’ve also resolved a max load issue that arose when a massive amount of inventory data was passed between Treez and Metrc. This fix will make sure that no matter how much information is being sent between the two platforms they’ll always be able to communicate with one another. For our customers who sell non-standardized sizes of prepack flower, we’ve added a 17.5g size to the dropdown on the PO. If your shop utilizes our rewards as a discount feature, you’ll now be able to report on all points activity in Metabase, including how many have been credited, redeemed, and returned to a customer’s rewards balance due to a refund. Our new backend Patient Intake configurations allow us to make certain customer fields, like driver’s licenses, first and last name, and/or date of birth required (or not!) when saving a new customer profile. By default, these fields will be required, but can be disabled by reaching out to support. We’ve fixed the display issue that was causing your taxes to be displayed in inverse order in the tax module. Don’t worry, even though they were shown in the wrong order, they were still calculating correctly. The issue that was causing the "Inventory Valuation - Real Time" question in Metabase to display a value that was not consistent with their actual inventory displayed in the portal has been resolved. Now, regardless of where you’re viewing this data, the numbers will line up. We’ve improved the load speed of the overview page in the Cash Handling module, so in the event you still have a lot of ended shifts waiting to be closed, the page will still load lightning fast! As a reminder, you should be closing out each of your shifts nightly, not just ending them through Sell Treez. Print out the close shift Quick Guide. We’ve optimized our online menu to work with older devices. The only limitation is that the menu won’t display properly when viewed in landscape mode, but as long as you use it in portrait mode, you’ll be all set. (NV Only) For our customers on Metrc, we’ve updated the way we send product information to the state to ensure the unit count and weight are always aligned in both systems. There was an issue that was preventing PO’s from saving properly, which occasionally, resulted in line items disappearing from them once they were Accepted. Going forward, you should have no issues with products saving to your PO’s. We fixed the issue that was causing the cost/unit to display incorrectly in the Profit Report. Going forward, whatever cost/unit is entered on the PO will be accurately reflected in this column. Additionally, this was the same issue that was causing the cost displayed on the POS Table in Metabase to display inaccurately. Thus, this problem has also been resolved and the amount shown in Metabase will now match the cost shown on the Profit Report. For compliance reasons, we’ve added a configurable Prop 65 warning to Treez. Once enabled, a standard, compliant warning message will be displayed to customers at checkout. We’ve restored the pop-up that displays when attempting to check in a returning customer with an expired ID. We’ve fixed the issue that was causing the refund button to be hidden when searching through a customer’s past transactions. Now you’ll be able to make exchanges and refunds lickety-split. The wrinkle with the online menu has been ironed out. No matter how many products you have, we’ll make sure they’re all displaying correctly. The issue that was preventing PO’s with non-numeric product sizing selected (i.e. “cone”, “doobie” etc.) to be blocked from saving has been resolved. We’ve resolved the issue that was causing inventory counts to save incorrectly for operators using State Tracking IDs and Lot Numbers. To help keep you compliant, we’ve added the expiration date and batch number to the patient label. These fields will be pulled from the information entered on the associated PO for each product being purchased. When viewing your stock inventory in Metabase, we’ve added some additional filter functionality to the PO status column on both the PO and Inventory Reports. Meaning, you’ll now be able to sort your inventory by ‘Draft’, ‘Open’, or ‘Closed’ PO’s, which will ensure products from your draft PO’s aren’t getting lumped into your stock inventory valuation calculation. We’ve fixed the issue that was causing product sizes to occasionally display incorrectly in Sell Treez after editing its size on an already accepted PO. Headed your way by popular request, is a handy new gender field on the customer profile! Capturing this information at Intake, will allow you to better understand the visit and purchasing habits of your customer base — surfacing valuable demographic insights we know you’ve been waiting for. To make life easier on you and your accountants, we’ve redefined the way you can treat rewards points. Instead of rewards dollars being applied as a payment type (as it’s been), we’ve created a setting that lets us enable rewards as a discount. Once rewards as a discount has been turned on (FYI you’ll need to reach out to us to do that), rewards will be applied from the cart screen of Sell Treez by clicking on the ‘Discounts’ button — just like other POS discounts. This means, instead of seeing “Points” grouped with other payment types, you’ll see the “Rewards Dollars” discount spread evenly across all items in the cart, as well as broken out below the ‘Total Discounts’ ticket line on the receipt. Since this change will impact your accounting, we recommend talking with your finance team before getting us to make the switch, and aiming for the first of the month to make tracking rewards redemptions easy-peasy. After you’ve enabled rewards as a discount, you’ll notice another great feature on the payment screen of Sell Treez — our ‘Target Total’ button. This handy tool lets you use a customer’s accrued rewards points to adjust the Grand Total down to a whole dollar amount (or an amount of the customer’s choosing). Essentially, erasing the need to collect or distribute coin change — cha-ching! CA Note: Even if the customer has enough accrued rewards dollars to discount the cost of the purchase to $0, they’ll still be responsible for paying the cumulative arm’s length excise tax with a standard payment method. Rewards dollars can only be used to discount the amount of excise tax associated with non-arm’s length products. Another highly requested feature that crossed the finish line, is the ability to add, remove, or update the customer attached to an order at any time during the ordering process! This means, if you forgot to assign a customer to an order before adding items to the cart, you can do so at any time without clearing out the cart. Similarly, if you assigned the wrong customer to the order, you can easily remove and replace them with the correct customer. If you need to update information on a customer’s profile from the POS, like adding a missed lifetime discount or updating a phone number, you can now open the customer’s profile straight from Sell Treez. Users can click on the “See contact info” hyperlink to open the customer’s profile in edit mode in a new browser tab. As soon as you hit Save & Back, you’ll be taken right back to Sell Treez where you can complete the sale lickety-split. Heads up! If sales associates don’t have access to Intake at your store, it’s best to get employees in the habit of directing customers back to your in-house reception team. Want to give your sales associates access to Intake or other modules? Page permissions can be managed from the User Management page by navigating to Configurations > User Management > User Groups. When searching for a customer’s name in Sell Treez, you’ll now have the ability to + Create New Customer profile if you aren’t able to locate an existing one. This feature is handy for adult-use only shops that aren’t required to have Intake and prefer to manage the entire customer experience from the POS. Note: Be sure you ask for other names the customer might go by before creating a new profile, as this may result in a duplicates. To improve clarity around which types of notes should be left where, we’ve renamed a few of the buttons in Sell Treez. Notes left in the box that appears when the Customer Notes button is clicked will be added to the customer’s profile, whereas notes added to the Order Notes box at the bottom of the screen will be tied to that specific order. A new 2.5g size has been added to the ‘Size’ dropdown on the PO for prepack flower. Signing up for eCommerce has never been easier! Now, online shoppers can create a eCommerce profile with either their phone number or email address. When multiple discounts are applied to an item in Sell Treez, the cart can get pretty long — that’s why we’ve redesigned the way we display applied discounts. This interface update is tied to turning on rewards as a discount. Meaning, if you haven’t had us enabled that functionality yet, which applies rewards points as a discount as opposed to as a payment type) then you’ll still be exposed to the old way of displaying this information. 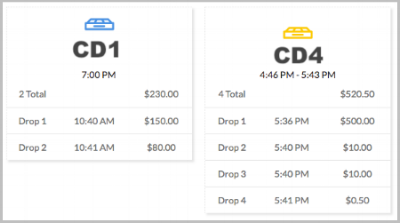 This condensed discount view streamlines the cart and makes it easier than ever to see the cumulative discount amount being applied to each ticket line. We’re forever on a mission to modernize and streamline the dispensary retail experience, which is why we’ve pushed an awesome enhancement to the Order Notes functionality on the Fulfillment dashboard. From here on out, if there’s no customer associated with on Express or In-Store order, the cards on the Fulfillment dashboard will show any documented order notes where a customer’s name would normally be. Dispensary staff can use this field to include relevant information about the customer so they can easily be associated with their order later. Note: Order types appearing on the Fulfillment dashboard are configurable and can be enabled/disabled by navigating to Configuration > Config Page > eCommerce > Saved Sales Fulfillment. To help reduce confusion during the PO creation process, we’ve updated the name of the “Price (Excluding Excise Tax)” to simply read “Price”. In this field, you’ll be entering the retail price the product is being sold for, plain and simple. Occasionally, the info you entered for a custom price for 1 or more product(s) would mysteriously disappear from their designated fields, leaving you with a “now you see it, now you don’t” type of situation. But we said the magic words and made it so those numbers and notes will stay put the first time they’re entered. Still don’t have our Custom Price Adjustment feature enabled? Head to Retail Products > Discount Management > POS Discounts > Pricing > Enable Custom Price Adjustment. We saw a resurgence of the one cent discrepancy that occurred when partial refunds were processed. Seems like we only partially squashed that bug last time, but we returned it to our engineers and they refunded us with a complete fix. The issue preventing reactivated users from appearing on the Sell Treez point of sale login screen has been resolved. If your shop has rewards enabled, manager’s can once again edit the amount of accrued rewards from within a customer’s profile by tapping Edit on the ‘Rewards’ card and entering the same PIN they have configured for the POS. Utilizing your personal PIN, instead of a generic one for the store, improves accountability and transparency when it comes to dishing out rewards dollars. For a more curated retail experience, you can manually create discount Buckets by scanning individual product SKUs and grouping them into a single promotional category. And now, you can create groups of 10+ SKUs without issue. Automatic discounts that were built using the ‘Size’ filter to define a product bucket weren’t applying correctly in Sell Treez. So, we’ve made a few minor adjustments that will tailored our bucket filters to fit just right. We’ve shipped a fix for the issue that was causing the discount amount for brand specific BOGO discounts to display differently on the Fulfillment dashboard than in Sell Treez. We’ve straightened back up a handful of dropdown menus that got knocked a little off center in our last release. We’ve reverted the change we made to the rewards points configuration in our last release. This fix restores your ability to decide whether you want use rewards dollars towards the Subtotal or the Grand Total when paying for purchases. Depending on which option is selected will determine whether rewards can be used to pay for taxes or not. Try it out: Configurations > Config Page > Rewards > Rewards. In our last release, tickets that had multiple POS discounts applied and included one or more 100% discount, were displaying incorrectly on the POS Ticket Report. We identified the communication issue between Sell Treez and the report and made a change that will allow this information to be displayed correctly. We’ve resolved the issue that was preventing you from being able to make payments to PO’s by clicking on the payment icon on the Purchase Order Report. The issue that was causing automatic brand-specific discounts to apply incorrectly in Sell Treez has been resolved. If you don’t have a ‘senior’ Patient Group discount created in the discount module, our recent update to this functionality — where the ‘senior’ discount gets automatically assigned to any customers who are 65 and older — will no longer prevent you from saving the customer’s profile. Ready the carrier pigeons! The issue that was preventing you from being able to checkout delivery orders has been resolved. When the auto-print receipt functionality is enabled for online ordering, the customer’s full name will be clearly displayed on the receipt, along with the sales associate’s first name (or however it appears on the POS sign-in tile). Previously, attempting to scan a SKU containing a dash (Ex: TWB-45G) on the Fulfillment dashboard wasn’t recognized. However, we’ve updated the scanning logic to make it work the same way it does in Sell Treez a.k.a awesome. After adding an awesome new nickname field into the customer profile, we realized that you didn’t have the ability to edit it. Don’t worry, we’ve nipped this problem in the Bud, Buddy, Billy… whatever you want to call it, it’s fixed! When returning product to the vendor through Inventory Control, the same amount will be displayed in the Vendor Debt section of Cash Handling as is shown in the Purchase Order Report — exactly as we (originally) designed it to. We’ve squashed the duplicate order error once and for all! From here on out, when a customer places an online order, one (and only one!) order will appear on the Fulfillment dashboard. We’ve added a new configuration to the Cash Handling module that lets you select the kind of float your shop enlists — a “static” or “dynamic” float. Based on which option is selected, Treez will only display fields that are relevant to your operations when closing out a shift. Basically, this means that if “dynamic” float is enabled, we’ll display more fields on the Close Shift window so you can adjust your float more regularly. Try it out: Configurations > Config Page > Cash Handling > Cash Drawer Settings > toggle “Use Dynamic Float” on or off based on your internal preferences. If your shop serves both adult-use and medical patients, it’s safe to assume that a customer’s status (Adult-use, Medical, or MMID) will change over time. For audit purposes, it’s important to understand which purchases were made when a certain status was assigned. That’s why we’ve begun logging this information each time a customer makes a purchase. This will ensure you’re able to prove you’re always selling within allotted purchase limits for your various customer types, and since this information is valuable reporting data, you’ll be able to pull this information in Metabase starting today, but won’t affect sales made before today. Not to mention, you’ll also be able to filter by customer type on the POS Ticket report, and this change will effect the calculations displayed on the Excise Tax Report and the Tax Report. Note: This change is not retroactive, so only purchases made since this went live will be logged. We’ll be populating this information for all historical tickets in one of our upcoming releases. Starting today, we’ll be logging the names of the users who’ve created and ‘Accepted’ Purchase Orders in our database. While this information won’t be accessible in Metabase quite yet, we’ll be working towards providing this information to you in a more accessible format in the coming weeks. As we work towards making our rewards system more intuitive, we’ve removed a configuration that you may have been used to seeing—apply rewards points to the Subtotal vs. the Grand Total. By default, when rewards are used to pay for purchases, they’ll be applied towards the Grand Total. Our in-house mathematicians have erased the error that was causing the rewards balance to be calculated incorrectly for a customer’s profile that was merged through our Advanced Configuration page. The minimum dollar redemption amount setting, that dictates the lowest amount of points a customer can have before being able to redeem their rewards has been restored. We’ve shipped a couple fixes surrounding discounts. In addition to restoring the stacking vs. non-stacking functionality, we’ve also resolved the issue that was preventing POS discounts from being applied on top of automatic discounts. We've also sorted out the issue that was causing discounts to not be applied properly when the ‘Syncing’ toggle was disabled. Get ready to discount to your heart's content! Receipts printed from the ‘View Recent Receipts’ view of Sell Treez will now include a mention of how many rewards points were earned on the transaction—the same way it does when the receipt is printed originally. The issue in Inventory Control that was causing the ‘Cost/Gram’ to display incorrectly for different size batches of the same shipment has been resolved. Happily, this was only a display error, so none of the taxes calculated on these batches were negatively impacted. We’ve resolved the other display issue that was causing the taxes to be printed out of order on the receipt. No need to worry about improper tax calculations though, we checked to make sure they were compounding correctly, we simply got our lines crossed when passing this information from our database to your printer. We’ve resolved the issue that was causing the breakdown in communication between the POS Ticket report and the Shift Report section of Cash Handling. Now, when you make an adjustment (+/-) to your secondary payment types on the POS Ticket report, those changes will be accurately reflected within Cash Handling. There was a wrinkle in our system that was preventing customer's from being able to create a new eCommerce profile or update the customer status linked to their account. Luckily, we were able to iron that issue out and now these processes are as crisp as ever. A ton of fixes have been pushed to the Fulfillment dashboard that will ensure accurate order information is being shown and that orders don’t get stuck in the incorrect columns. We’ve also sorted out the issue that was causing tickets with ‘0’ items to appear when edits were made to a customer’s profile as well as getting rid of the problem that was causing duplicate orders to be created when Treez switched between cloud and local... and this doesn’t even begin to scratch the surface of the numerous stability enhancements we’ve made! We’ve shipped an enhancement that will safeguard against accidental double clicks of cash payments in Sell Treez. When checking a customer out, we’ll make sure the cash tiles become grayed out as soon as one of them has been clicked. We’ve fine tuned the way our filter functionality works within the Discount module. Now, when creating a discount ‘Bucket’, the filters you apply to it — such as Brand or Subtype — will no longer require the search terms to be case sensitive in order to return applicable results. While we were at it, we also restored the functionality to the “Syncing” toggle, to make sure your promotional program is humming. We’ve knocked out the issue that was causing non-stacking discounts to compound together in Sell Treez. The 'rewards as a discount' functionality was rolled back for accounting purposes. We'll re-release this feature at the beginning of the calendar month to make balancing your books easier. We’ve also sorted out the issue that was causing an error message to be displayed when edits were made on the POS Ticket report. Going forward, you should have no problem saving your changes — assuming you’ve entered the updated amounts correctly, of course. When exporting the Daily Totals from the Cash Handling module, the report was downloading as a blank sheet. Luckily, we were able to tinker with some loose wiring and jumpstart the export process so this information will be downloaded exactly the same way as it's displayed in the portal. We’ve refined the logic associated with cash drops, so you can now enter a value that’s equal to the cash amount transacted on that register. Previously, you were only able to enter an amount that was less than the total, even if that was just a penny. We’ve pushed a series of fixes to the Fulfillment dashboard, which will help ensure that order information is displaying correctly and tickets aren’t getting stuck in incorrect columns. In order for you to be able to separate the true product cost from the cost + excise tax, we’ve added a pre-excise tax cost field to the POS Ticket table in Metabase. This addition will allow you to report gross margins more easily and understand how much excise tax has been paid up front to the distributor compared to how much is still owed. The next time you look at the customer profile, you’ll notice a few enhancements that are geared towards customizing the in-store experience for your patrons. Not only have we added a nickname field, we’ve also improved the lifetime discount functionality. Now, when the “Customer Groups” toggle is enabled (formerly titled “Apply Discount”) a dropdown will appear where you can assign any number of discount groups to each customer. Even better, once a customer turns 65, we’ll automatically assign them to the senior group — so you don’t even have to think about it. Psst! Don’t want customers to automatically be added to the senior discount customer group? Shoot us a note as we’ll turn it off. When closing out a shift and entering values in the coins fields of Cash Handling, we’ve made it so the numbers entered will populate in the cents locations first. For example, entering 4-0 will be recognized as $0.40, instead of as $40 as it did previously. We’ve resolved the issue that was occurring in Cash Handling when cash drawers with $0 transacted on them were being closed out. The issue that was blocking certain user roles from being able to print the PO has been knocked out. As long as you’re able to access the purchase order, you’ll also be able to print it without issue. We’ve sorted out the issue that was preventing users from being able to sort each column of the Fulfillment dashboard by ticket size. If you thought Sell Treez was fast before, just wait until you see our new master calculator in action! We’ve made some serious improvements to our ticket calculator, which means ringing customers up and checking them out will be lightning fast. We’ve made some improvements to the POS Ticket report. Now, when an adjustment is made to the a payment method associated with particular ticket, that information will also be updated within the Daily Totals section of Cash Handling. We’ve ironed out the issue that was causing the word “ARRAY” to appear in the cost/unit and excise tax/unit fields on the purchase order. Going forward, the information entered into these fields will remain locked and loaded, unless manually updated. We’ve corrected an issue with the Purchase Order that was preventing it from saving when merchandise items were added to it. We’ve also improved the performance and stability of the purchase order overall. We’ve restored the ability to print package labels from the PO for prepacked flower products. We greased the wheels on the Fulfillment dashboard so orders will move seamlessly between the various order stages. This will occur regardless of whether the status has been updated manually through the ‘Saved Sales’ view in Sell Treez or if it happens inline with the standard order fulfillment process. When creating prerolls from shake and crumb, these in-house offerings will appear grouped with other preroll products, instead of appearing with standard flower items, which was the case previously. We’ve improved the load speed on the Cash Drop pages found both within and outside of the Cash Handling module. This slow load speed if often caused by old shifts being left open instead of being properly closed each day. The surest way to improve the performance of your Cash Handling module is to simply remember to close your shifts each night. You told us that when a new customer places an order online, the ‘Cancel Sign Up’ and ‘Save’ buttons were only visible after the page was refreshed. Luckily, we were able to identify the root cause of this issue and restore it’s functionality. We’ve resolved the issue in Sell Treez that was causing the Grand Total to be calculated incorrectly when the quantity of an item was adjusted using the ‘+’ button. *This only was affecting our beta customers who were helping to test our new master calculator. We’ve made a few adjustments to the Purchase Order to ensure any lab results entered will be properly displayed on the online menu. Likewise, we’ve improved the excise tax calculation that occurs when the ‘Restock’ function is used and resolved the issue that was causing the PO not to save when the prepack toggle was enabled. We've fixed then the online menu configurations there’s a ‘Display Pricing Tiers’ toggle, which allows you to decide how your product pricing is displayed online. As a side note, if this toggle is disabled then only the sizes you have in stock will be displayed. If it’s enabled then all pricing tiers will be shown, regardless of whether they’re in stock or not. Check it out: Configurations > Online Menu > Menu Config > enable or disable ‘Display Pricing Tiers’ toggle. We resolved the issue that was causing product descriptions to get erased when the ‘Restock’ function was used. Now, when you restock a product, the description that was entered previously will carry over to the new shipment as well. For all our heavy hitters out there, we’ve added a 3g cartridge option to the ‘Size’ dropdown on the purchase order. We’ve gotten a few reports of lab results not saving properly on the purchase order, so we ran a few tests of our own. Luckily, we were able to diagnose and remedy the problem. We’ve resolved a display issue that was occurring during close shift procedures in the new Cash Handling module. Now, when an alternate payment type is entered, the difference column will reflect the correct amount. We’ve added some supportive text to field where you need to enter the MMID number in a patient’s profile. This should help reduce some of the confusion as to why a profile doesn’t save as a medical patient when the toggle is enabled and no number is entered. As a reminder, if the ‘State Medical ID #” is enabled, the ID number must also be entered on the row below. For our NV customers who are already operating on the Metrc system, we’ve added the ability to print the state tracking ID on the customer label. This way, you’re compliant from the time the product enters your shop to the time it’s adopted into its forever home. If you support online delivery orders, you can now decide whether you want to require customers to meet the Subtotal or the Grand Total when it comes to the delivery minimum. If you want taxes to be factored into the delivery minimum, toggle this slider to ‘Grand Total’. If you’d rather require the minimum to be met before taxes are applied, toggle it to ‘Subtotal’. Try it out: Configurations > Config Page > eCommerce > General Requirements > Toggle Delivery minimum slider to ‘Subtotal’ or ‘Grand Total’. When entering a custom cash amount on the checkout screen of Sell Treez, the cursor will automatically snap into the amount field located above the keypad. This will help reduce unnecessary clicks when it comes to handling tricky tickets with multiple payment types. When there’s no customer attached to an order, the ability to refund the amount in points will no longer be available. Which makes sense, since we wouldn’t know who to refund the points to anyways. When it comes to displaying prices on your online menu, it’s best to keep customers in the know about how much their purchase will cost out the door. With our updated eCommerce pricing toggle, you can decide whether to display “All taxes incld.” or “Plus tax” below each of your prices online. Keep in mind, this toggle won’t affect the prices being shown — you’ll need to establish those on your own — this toggle will only alter the copy displayed. Thus, if you bake the cost of all taxes into your retail prices you’d want to set the slider to “All Taxes Included.” Try it out: Configurations > Config Page > eCommerce > Display Preferences. Opening an order on the Fulfillment dashboard will reveal different actions you can take on it. Clicking on “Print Order” will now allow you to print one of two things, the receipt or a customer label — meaning, you no longer have to wait until checkout to make sure your products are labeled in a compliant fashion. Just be sure you have the correct printers hooked up. The reason you leave for cancelling an through the Fulfillment dashboard will now be texted to the customer along with an automatically generated order cancellation notification. While you’ll likely already have been communicating with the customer prior to the cancellation, we figured it couldn’t hurt to reaffirm why the order was being removed. We’ve resolved the issue that was causing orders placed by new customers to get stuck in the ‘Verification Pending’ column of the Fulfillment dashboard. Now, once a customer has been verified through Intake, their order will seamlessly transition into the ‘Awaiting Processing’ column. Previously, there was a wrinkle in the system that would cause a duplicate order to be created when an edit was made to an eCommerce order through Sell Treez. We’ve ironed that bad boy out so only the original order will remain — no matter when, where, or how you edit the order. Say goodbye to 0 item orders getting stuck on the Fulfillment dashboard. Those can now be removed without issue, just like any other order. Regardless of what size of prepack flower is entered on the purchase order, the correct package sizes will also show on the menu. When we gave our new Cash Handling module the modern upgrade it deserved, we went a step further and also gave it the downsize you’ve been asking for. Now, if you’re not interested in using Treez to track and manage your finances or pay vendor debt, we can enlist the help of a more basic Cash Handling module. If you’re interested, shoot us a note and we’ll set up a time to discuss it with you live. Metrc, Metrc, read all about it! As we draw nearer to Metrc being implemented in California, you’ll begin seeing more state-mandate fields popping up throughout the product to help you track your products from intake to sale. One new field you may notice on the PO is for the “State Tracking ID” number. Clicking into this field will allow you to scan the barcode provided by Metrc and capture the Package ID number associated with the shipment. Don’t worry, we haven’t implemented this requirement yet, but we will once Metrc goes live. It turns out that when you were accessing the ‘Edit Products’ page, you were most often interested in editing your live inventory. With this is mind, we’ve updated the default view to be live inventory—as opposed to stock inventory. When creating a new user and selecting a POS PIN code, you’ll now be able to choose one that’s longer than 4 digits. We made a “cents-less” error when it came to rounding out the Grand Total checkout, which caused the amount due to be off by a penny. We’ve rounded out the edges, so now the total will round to an even amount. When processing refunds, we’ll base the refund amount on that which was paid as opposed to the amount tendered. Meaning, customers will no longer be given the opportunity to earn more money back than they actually spent to begin with. Phew. We squashed the bug that was causing excise tax to be calculated as $0 at checkout when the cost of a flower product had been changed on the PO after the product had already been made live. We’ve made some color enhancements to the icons within the Cash Drop section of the Cash Handling module. Now, ‘Open’ shifts will appear with a blue icon, while shifts that are ‘Ended’ or ‘Closed’ will have a yellow icon. This update should help you differentiate between the shift statuses at a glance, so you’re never confused about which shifts are still active, and which have already been ended or closed. We’ve polished up some of the new features within the Cash Handling module surrounding expense tracking, accurately reflecting closed shifts on the Daily Totals tab, and the printable format of the Cash Drop page. We’ve added “heartlet” to the size drop-down for ‘Flower’ products on a Purchase Order. We’ve also gone ahead and arranged the available options in alphabetical order to make locating the correct option easier. We hope you <3 it. Cash drops have been restored on the End of Shift report. Abracadabra alakazam! The issue that was causing your draft receipts to magically disappear has been snuffed out. Now, when a ticket is navigated away from mid-transaction, it will remain accessible within the ‘View Draft Receipts’ page up to 60 minutes (or for whatever custom timeframe you have enabled), until its auto-abandoned by the system. We’ve introduced a self-service upload and edit feature to the membership agreement, so you can make custom adjustments with a few swift clicks. This will provide an interim solution as we work on creating a more robust and customizable membership agreement tool. To upload a new agreement document or edit your existing one, navigate to Configurations > Config Page > Patient Intake > Patient Agreement Content. If you have multiple shops operating on the Treez platform, your customer directory’s will now be able to talk to each other. This means, if a customer signs up at one location, their information will auto-populate in the customer directory in every other one of your locations. Now, that’s what we call internal communication. Who has fat fingers? We do, we do! Which is why we’ve moved the ‘Abandon Sale’ option further away from ‘Save Current Sale’ in the Current Sale timer drop-down. This should help reduce instances of orders getting accidentally removed when you were actually trying to save them. Note: Moving the ‘Abandon Sale’ option closer to the ‘End Shift’ button made our Spidey-Senses tingle. That’s why we’ve added a new end shift confirmation window, so you don’t replace accidentally abandoning a sale with accidentally ending your shift. Boo-yah. Previously, there was no way to remove automatic discounts that were being applied to products in Sell Treez, which depending on how your discounts were set up, meant that some lucky customers may have been receiving a pretty hefty price break at checkout. From here on out, the odds will forever be in your favor as you’ll now have the ability to remove individual auto-discounts line-by-line. Note: If your automatic discounts are created as “stackable”, then all applicable discounts will be displayed on each line. If they’re not stackable, then only those discounts being applied will show. 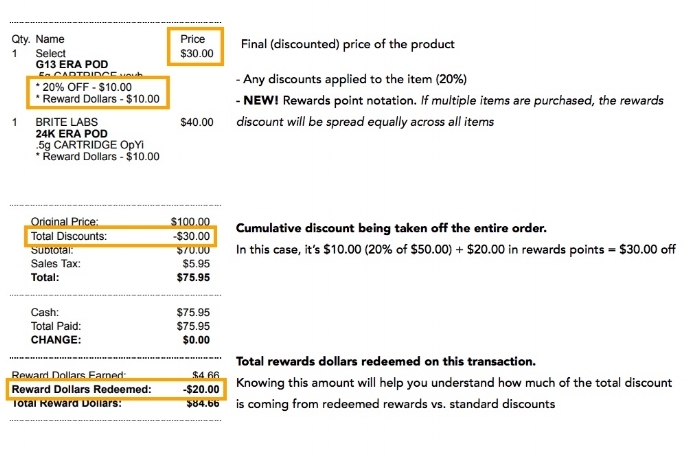 What determines if a non-stacking discount is eligible for a certain product or bucket? Well, this depends on whether you’ve elected to “favor the customer when applying discounts” within the ‘Discount’ configurations or not. We’ve made the Treez logo located in the upper left-hand corner of the customer queue within Sell Treez clickable. This will allow you to navigate back to the main portal page more easily. A little-known fact about the ‘Misc.’ product category is that it’s reserved for miscellaneous cannabis products — like a transdermal patch or toothpaste — not assorted non-cannabis items — like batteries or paraphernalia (that’s ‘Merch’). To help make this distinction, we’ve renamed this category to “Misc. Cannabis” and as mentioned, should only be used for various cannabis-infused products that don’t fit comfortably in one of the other standard product buckets. With our enhanced return to vendor functionality, each time you return a product, a new RMA PO will be created with a negative balance. From within the PO report, RMA PO’s will be marked with a red truck icon, and clicking on it will link you back to the original PO the item is associated with. Also, if you've already sold some of the products from that batch, the system will now be able to recognize that, and will only return the actual number of units remaining in stock. Note: If you already have an open RMA PO for a particular vendor and you end up needing to return additional items to that same vendor, all products being returned will populate on the same open RMA PO. This should help make tracking your owed amounts easier and more efficient. When updating the expiration date on a customer’s profile, you can click the ‘Identification Exp Date’ icon located at the top of the screen. Doing so, will reveal a calendar next to the appropriate field, so you never have to wonder if you’re entering the correct date in the correct place again — you’ll just know! When you asked to be able to apply multiple lifetime discounts — senior, employee, veteran, etc. — to a single customer, we listened. Now, you’ll be able to select as many discount groups as you’d like on a customer’s profile. Depending on how you have these types of discounts set up will determine how they apply and appear in Sell Treez. Our in-house surgeons (who really know how to slice and dice some code) have given our Cash Handling module a gorgeous facelift. In addition to being revamped with a new, sleek look, we’ve also made massive improvements to the ‘Shift Report’ tab, which now includes separate tabs for viewing ‘Daily Totals’ — including ‘Actuals’ and ‘Expected’ cash by drawer — ‘Cash Drops’ performed during the day, and the same ‘Overview’ you’re used to seeing with a couple key enhancements. We’ve also introduced the ability to perform all End of Shift and Close of Shift functions from this page AND added the ability to reprint the end of shift receipt from here. As many times as you’d like, whenever you’d like! Our code surgeons were busy this week! In addition to making our User Management interface look a lot different — think Nicholas Cage to John Travolta in Face/Off different — they’ve also equipped you with a scalpel of your own. From here on out, working with user groups and allocating page permissions (to said user groups) will be in your hands. This means you’ll no longer need us to make adjustments to what pages certain groups have access to and what user groups are available to you. Instead, you’ll be able to do it yourself. We often get questions about taxes — How should they be set up? How does structuring them differently affect they way they compound together? How do I know if they’re set up properly? Well, since we’re not tax experts, and we want you to feel confident making these updates on your own, we’ve added a tax calculator to the side of the tax module. This calculator will update every time you save a change, so you can make adjustments to the layers and see exactly how those changes will affect the calculations. As a reminder, you should always consult a tax professional before making any changes to your tax structure. Rules, rates, and regulations are frequently changing, so it’s always better to measure twice and cut once when it comes to these kinds of things. Check it out: Configurations > Config Page > Tax Rates > Point of Sale Tax Set up. With the appropriate doctor’s recommendation, medical patients who are younger than the standard 18 or 21 years old are approved to make purchases. That’s why we’ve updated the ‘Age Restriction’ configuration field to allow for freeform entry. This means you can choose for yourself what the minimum acceptable age is for both medical and adult-use customers should be in your shop. Try it out: Configurations > Config Page > Purchase Limits > Customer Restrictions > Age Restrictions and enter the minimum age your shop would like to cater to. We’ve made the End of Shift receipt even more granular when it comes to displaying the breakdown of your taxes. This is especially great news for shops that serve both adult use and medical customers, as taxes relating to each customer group will be shown separately. Need some help finding answers to your most pressing Treez questions? Once you’ve logged in, you can click on the orange ‘Help’ tab to search through our help center, read FAQs, send us an email, or chat with us directly. What’s that? You say this widget has been there this entire time? Well, you’re right! The only change here is that you’ll have to be logged in to be able to access it. When pausing a shift or being logged out due to inactivity, we discovered the print location you had set before going on break wasn’t maintained when you logged back in. Now, the location you’ve selected before being logged out will be the same as when you log back in. Woohoo! We squashed an excise tax bug that occurred when you altered the cost of a flower product on a PO after already going live with the batch. Now, excise tax will be properly calculated at checkout — no matter when or how many times you change the cost on a PO. When printing a PO that had line items deleted from it, the printed page would contain the deleted items. Obviously, this isn’t quite what we were going for, so now, when printed, it will only display the items that are actually contained within it. When updating a customer’s driver license expiration date, the calendar would previously display in a place that would cover up the date entry line, whoops! We’ve knocked the calendar widget down a notch so the date selection process is even more seamless… so seamless, you probably won’t even notice the difference. When printing a large number of labels very quickly, sometimes, the printer gets stuck and requires you to manually clear the print queue. For those of you who’ve encountered this issue, it’ll be resolved once you update the Treez Hardware Agent. To update HWA, click on the orange 'Help' tab > Downloads & Tools > click on Treez Hardware Agent .44.msi to download the new file > Repair > follow the prompts to update. Speaking of printers, we’re now able to support a GK420d printer, if that’s your device of choice. Shortly after our last release, it was discovered that adding prepack flower to a customer’s cart would cause it to ring up as $0. Obviously, this was at least a few dollars short of the initial retail price you set. Now, the retail price for prepack flower is being accurately reflected in Sell Treez. As we work to remove some underlying issues with the ‘Live Inventory’ report, we’ve removed the date filter—so only today’s data is available. We’ll be addressing the root cause of the problem in the coming weeks, but in the meantime, you’ll be able to access the same information through Metabase. Squashed a couple of pesky bugs that were caught crawling around the online menu and in Customer Intake. As was the case before, flower residing in stock inventory won’t show up for sale online, and adult-use customers will once again be required to have a birthday entered on their profile to check in. Psst! They also have to be 21+, but you already knew that. We made a few adjustments to the logic accompanying our new “Go Live” from POS functionality. Yesterday, it was more of a ‘now you see it (go live), now you don’t (on your online menu)’. Going forward, making a product batch live from the point of sale will also cause it to properly display on your online menu and within Sell Treez. Ta-da! We’ve restored the ability to search for products in Sell Treez. Starting today, you’ll have the ability to name your own price at checkout. With our new ‘Custom Pricing’ feature you can set fixed price discounts—did someone say $1 deals?—or enter a custom total price for any number of selected items in your cart. To set up fixed price discounts and enable ‘Custom Pricing’, navigate to Retail Products > Discount Management > POS Discounts > Pricing. To save you time at checkout, we’ve introduced the ability to apply a discount to multiple selected line items at once. Highlight 1+ products by tapping on them (to turn them green), then, choose the appropriate price break that should be applied to all highlighted items. Bing, bang, boom—just like that you’re able to apply a discount to multiple items faster and easier than ever. (CA) We’ve introduced a “Manual Calculate” slider on the purchase order that can be used to override the auto-excise tax calculations you were previously locked into. When enabled, this slider lets you enter a custom excise tax amount that isn’t linked to the total cost of the product shipment. This feature makes it so a distributor can offer you a product at a discounted cost but is still able to collect an excise tax amount that’s separate from that. Learn more. We paid a little extra attention to the excise tax report this past week and made it more efficient, especially when collecting and displaying data over multiple months. We’ve also added some tooltips to help you better understand exactly what you’re looking at. We heard the prorate slider was unintentionally causing some discrepancies between the total cost and outstanding balance reflected on the PO. We went ahead and (pro)rated that issue a 0 out of 10, and got it all fixed up. When searching for a customer in Sell Treez, cancelled sign-ups were populating in the search results. We’ve adjusted the logic so only valid customer profiles are returned. If local regulations require you to affix customer labels to every purchased item, you can now specify which customer type (medical and/or adult-use) those labels should print for. Try it out: Configurations > Config Page > Point of Sale > Point of Sale > enable ‘Customer Label’ > select which customer type(s) the label should print for. You mentioned the lines in your customer queue were getting a little long, so we’ve created a way to let you cut them. Once configured, you’ll have the ability to clear the customer queue from intake whenever you’re feeling devious. Try it out: Configurations > Config Page > Patient Intake > Patient Sign Up > toggle ‘Show Clear Queue Button at Intake’ to on > a trash can will display at the top of the customer queue in Patient Intake. Guess what? If you want to have excise tax included in your product prices displayed online, you’re in luck! Enabling this configuration will bake the excise tax cost into your prices while disabling it will show the phrase “Plus Tax” below each product. Try it out: Configurations > Config Page > eCommerce > Display Preferences > scroll down to ‘Tax Display’ > enable ‘Post Tax’ toggle to include excise tax in your online menu prices. Because you’re now able to scan an ID at the POS to check a customer in, we’ve set up a few roadblocks to ensure no one is able to cruise through accidentally. When an ID is scanned for a returning medical customer with an expired rec or you attempt to check in a customer who’s aged 18-20, this will cause various notifications to display in Sell Treez. These blockers will direct sales associates to “convert the medical patient to an adult-use customer” or “update their recommendation information” before continuing. This is one kind of traffic jam we’re ok with. *Only applicable in shops that serve both customer types. The automatic texts sent through eCommerce were looking a little tired so we gave them a teensy-weensy facelift. Our surgeon was pretty good, so you’ll barely even notice the difference. Last week, we announced the ability to scan a customer’s ID directly from the POS terminal, which was one small step for efficient workflows and one giant leap for Treezkind. As it turns out, the original landing site lacked a little gravity and that feature floated over to another location within the ‘Configurations’ tab. Don’t worry, it’s the same great feature, just in a swanky new home. Find it: Configurations > Config Page > Point of Sale > Customer Management. If you check customers in at the POS, we’ll perform the same checks and balances that occur at Intake. This means you’ll be informed if someone is underage or if their license is expired, and will be unable to complete the order until that information has been updated. We heard you didn’t like the way we were loading customer history, which is no shocker, we were loading it backward after all. So we’ve flipped the switch and made it so the most recent orders populate at the top of the list. Duh. Previously, creating a ‘Delivery’ order and then changing the order ty to ‘Pick-Up’ would cause the delivery address and delivery tax rate to get stuck on the order. Luckily, we found some Goo-Gone laying around the office and were able to wipe that problem away. We were able to ‘shake’ the issue free that was causing incorrect product names to print on customer receipts. Regardless of how your float is configured for End of Shift procedures — “count cash first, then remove float” or vice versa — we’ll make sure the count accurately mirrors your desired setup when displaying your totals by register in your ‘Close Shift’ proceedings. We’ve addressed the issue that caused the ‘Sign-Up Date’ discount to be applied to customers well after their sign-up date. Sorry, we thought this was a speed dating event. If you’ve posted an incorrect (final) payment to a PO, causing the status to change ‘Open’ to ‘Closed’, you can delete the payment to reopen the PO. They say making assumptions is a bad thing, but when it comes to assuming a decimal in SellTreez, we think we’re right on point. Enabling an assumed decimal allows sales associates to type 5-0-0-0 on the checkout keypad and have the system recognize it as $50.00. Try it out: Configurations > Config Page > Point of Sale > User Interface > Auto Decimal. Reprinting your End of Shift receipt has never been easier! Each time you end your shift, we’ll trigger a pop-up asking if you’d like to “Reprint Receipt” or “Confirm” your end of shift action. Here’s the SKUp. Now you can use the product SKU to perform a search in SellTreez. Note: the SKU is case sensitive. Try it out: SellTreez > Click into ‘Search Product’ bar > enter SKU. Customers can select whether they’re a Medical or Adult-Use customer when signing up through eCommerce. If ‘Medical’ is selected and a state ID is uploaded, Intake will need to enable the state med ID toggle (in the customer profile) and enter their MMID number on the line below. The customer’s selection will dictate which documents are required for sign-up and which membership agreement is shown to them. Managers who want elite access to cash insights now have their own “Cash Manager” role. Cha-ching! This means any non-cash managers will lose access to the Cash Handling module and won’t be able to see account balances. We’ll be removing Cash Handling access to those manager roles in the coming weeks — we didn’t want to rip the rug out from under you. Try it out: Configurations > Users > Edit/Create New User > Role > Cash Manager. Enable the ability to scan a customer’s ID directly from the POS terminal. Check a customer in and complete their order in one fell swoop—no intake necessary! That’s what we call two birds, one stoned 😉 Try it out: Configurations > Config Page > Purchase Limits > Customer Management > Select scan at POS option that works best for you. Checking in a medical patient by searching their name in SellTreez will verify their doctor’s recommendation before proceeding with the order. If it’s expired, we’ll prompt you to convert them to an adult-use customer or send them over to intake where they can update their information. Say goodbye to creating time-consuming PO’s due to miscounts or remembering to make new product batches live in advance, and say hello to time-saving inventory adjustments made directly from the POS. If you’re ringing up an item and the inventory says you have ‘0’, but you have 1+ available, you can increase the quantity on the fly or make a product batch live directly from POS. Heck, you can even protect these functions with a manager PIN. Try it out: Configurations > Config Page > Point of Sale > Inventory Functions > Enable ‘Inventory Adjustments’ and/or ‘Go Live’ from POS. The ‘Recent Receipt’ page is now stacked with transaction statuses to provide you with big insights at a tiny glance. Whether it’s a completed order, a full or partial refund, or some combination of the two, you’ll get the whole picture for every completed order directly from the main dashboard. The names you give your discounts will appear on the receipt below the items they’re applied to along with the percent or dollar amount off they’re providing. While intuitive names are typically best… feel free to let your freak flag fly (or use it as a branding opportunity, whatever works best for you). Printing PO’s will no longer cause woes. The crazy formatting got nixed and the usable info’s been fixed. If you don’t want to hide your treasures behind an age gate, you can disable this feature on your online menu and make it accessible to all. Open sesame! Try it out: Configurations > Config Page > eCommerce > General Requirements > Age Gate > None. A self-service tool that allows you to enable a manager PIN to approve refunds. Try it out: Configurations > Config Page > Payment Type > enable ‘Allow Return?’ > enable ‘Require manager PIN’? We’ve jammed additional batch and retail label print functionality into every place we could think of… that’s one kind of printer jam we can live with. Try it out (retail labels): 1) Daily Procedures > Inventory Count > select Live Inventory from drop-down > tap print icon next to live inventory item to print retail labels. 2) Inventory > Inventory Control > Search product > click through to ‘Batch’ level > check the box > click pencil/edit icon to open product details > scroll to ‘Barcode’ card enter quantity > tap print to print retail labels. Try it out (batch labels): 1) Daily Procedures > Inventory Count > Stock Inventory > tap print icon next to stock inventory item to print batch labels. 2) Inventory > Inventory Control > Search product > click through to ‘Batch’ level > check the box > tap print icon at the bottom of the screen to print batch labels. We’ve upped the ante on the End of Shift receipt and added a bunch of highly requested information to the pot, including total sales, a breakdown of collected taxes, various payment type information, and shift/terminal details. We’re going all in on this one. We’ve enhanced our purchase limit feature to have shake and crumb purchases count towards a customer’s limit. Hello, my name is ________. For transactions made with a customer attached, we’ll display their name next to the appropriate receipt on the ‘Recent’ and ‘Draft Receipts’ pages within Sell Treez. When making a partial refund, we’ll only display enabled payment types as a means to return the payment to.When a return is made, you’ll be able to leave a ‘Reason’ explaining why the refund occurred, regardless of whether a customer is attached to the order or not. When a customer is attached to an order, all completed transactions will be displayed in the ‘Purchased’ tab from within Sell Treez. This will allow you to revisit their purchase history and remind them exactly what they had the last time they were there. Checking in an adult-use customer through the POS will no longer comb their profile for a medical recommendation expiration date. Obviously, they don’t have one of those, so we’ll only check for a valid ID expiration date instead. Even when all ticket lines are discounted 100%, we’ll display the refund button. Even though that’s crazy — who returns freebies!? Depending on which customer type is enabled, we’ll display the appropriate membership agreement to them. No more membership roulette. We’ve gotten rid of the issue where multiple discounts were overlapping on the receipt. Instead of stacking them on top of each other literally, we’ll allow you to stack them figuratively, so, they can compound together and be legible. Pushing an order to “Out for Delivery” on the fulfillment dashboard won’t cause the order status to display as complete. A “completed” status will be reserved for orders that have had actually been completed and have had a payment processed on them. If your store is configured to only accept adult-use customers, we’ll hide the “upload rec” requirements and only ask for a valid ID to verify their age and expiration date before serving up all your tasty online menu options. If you forget to enter a delivery date when taking an order, we’ll assume the customer wants it today and will display that information on the ‘Delivery Report’. If your state or local tax rates change at any point. We’ll break each tax rate out as a separate line on your tax reports. This will allow you to see exactly how much tax you’ve collected at the various rates as opposed to seeing one lump sum made up of multiple rates. Accepting a PO will change the status from ‘Draft’ to ‘Open’ and will prevent any changes from being made. When creating a purchase order for prerolls, edibles, or topicals, you may notice an old field with a new requirement*. Now, ‘Total MG Per Unit’ is required so we can properly calculate and enforce purchase limits. We heard that online menu wasn’t displaying the proper dosage information, which was clearly a swing and a miss. We’ve tightened our game up and made sure the correct players are being called up to bat. Orders created through eCommerce will load quickly and clearly on both the fulfillment dashboard and within Saved Sales. We’ve increased the amount time it takes for the transaction total to be calculated at checkout. While moving slower may not seem like an improvement, this extra second or two helps ensure purchase limits are properly measured and any discount calculations are taken into consideration before a customer can check out. Cha-ching! Customize your receipt to match your company’s lingo. Whether you call it “Budtended by”, “Sold by”, or something entirely different — this is a BYO”By” type of party. Try it out: Configuration > Config Page > Receipt > Receipt Footer > Enable ‘Show Cashier on Receipt’ > Configure your receipt! When a customer returns a product, leave a ‘Reason’ to let management know what’s up. Your ‘reasons’ can be seen in the corresponding receipt in Sell Treez and will show up in reporting. Prepack is back and it’s better than eve… well, actually, it’s back to the way it was before — appearing grouped with other ‘Flower’ products on your online menu. The ability to print retail labels has been restored. Sorry about that, we mistakenly assumed you wanted it all for yourself. Adding prepack flower products to your purchase orders will no longer prevent you from posting a payment. Phew! Even when an arm’s length product is purchased with a 100% discount applied, the taxable amount will be properly displayed on the POS Ticket report. The Delivery Report will display the correct delivery address as opposed to the primary address on record. For all the heavy hitters out there, we’ve added a 2.2g cartridge option to the ‘Size’ drop-down on the PO. You mentioned that you needed Samoa options for checking customers in at intake. Now you can scan driver’s licenses from all the U.S. Territories without issue. What did one decimal say to the other? You have a point. Just like you did when you asked to specify tax rates up to three decimal places, which you can do now. Try it out: Configuration > Config Page > Tax Rates > Update tax rates in any ‘Rate’ field up to 3 decimal places. Printing labels after making a product Go Live would cause the status to revert back to ‘Ready’. This was a clear failure to launch, which was almost as annoying as the movie, but not quite. Luckily, we were able to resolve with one of those issues. We’ve restored the ability to paste information into the fields within Intake… and really all fields in Treez. We were just a little short on glue last week. When using points to pay for purchases, customers will no longer accrue points on those same purchases. That’s what we call addressing the pain points ;). Update product photos and descriptions for your online menu directly from the eCommerce section of the product card. It wasn’t saving properly before, but it promised to play nice from here on out. Edit payment methods retroactively without having to worry about turning rewards points into debit transactions. Updating the cost per unit on a PO will update the associated cost on the PO report as well. Knock, knock. Who’s there? Cash drops linked to specific cash drawers on the End of Shift report. We looked into why you weren’t able to read your End of Shift receipts, and it turns out the issue wasn’t so black & white… it was actually grayscale. Now, the font will print as dark as night. Customers were reporting you were coming off as a little needy and sending them duplicate text messages during the order fulfillment process. Luckily, we got the hint and ousted that stage-5 clinger. We’ve added some flexibility to the ch@racter$ you can use in the product descriptions for your online menu. So go ahead and $%^# to your heart’s content. Your membership agreement has been relocated to a much nicer neighborhood, and its new home won’t require renovations every time you receive an update. Moving is hard enough as is. When intaking pre-pack flower, the excise tax will now be calculated on the appropriate jar/bag size. *Not to be confused with Jar Jar Binks, he’s something entirely different. Clicking on ‘See contact info’ in Sell Treez will allow you to add a customer’s phone number to their profile on the fly. No quippy copy here, that’s just good UX. Tired of waiting one whole hour for your data to display in Metabase? Us too. Now, you can access a bunch of your reports in real-time through the Metabase Live Feed. Thank you, almighty data wizards! Noticed a few cents difference between the cart totals and checkout totals? We’ve made some sense of this cents-less error and now these totals will totally match. Some of you may have encountered an issue with your printer location not being properly stored, but we’ve cleared that paper jam for you. Color-coded indicators attached to customer profiles that identify which customers are adult-use and which are medical. Just remember the rhyme: red is med and green is… awesome, too. Customize your eCommerce fulfillment dashboard to only display the order types you have enabled — regardless of whether you’re utilizing all (or none!) of the delivery, express, in-store, or pick-up options available. A warning pop-up will prevent you from being able to refund a ticket that’s already been refunded. Say goodbye to discrepancies on your POS report. Complete partial refunds by tapping the ‘Refund’ button. Oh yeah, that works too now. Refund items even if they have a 100% discount applied to them. Sounds like you’re giving this stuff away… can we have some? Abandoning a sale will no longer hold your inventory captive. Once you abandon an order the products will be immediately released back to your live inventory. Phew! Shout out to FL, this one’s for you. We’ve gotten rid of the date parsing issue you’ve been encountering at intake. Now you can check everyone in lickety-split.